Liverpool waterfront – eat your hearts out, everywhere else! Yesterday I visited the Liverpool Cruise terminal. I was interested to learn how Liverpool has grown in recent years as a cruise destination, both for day calls and also for turnarounds, and about the new facilities that have been introduced to support turnaround operations. These days Liverpool is regularly receiving day calls by some very large ships – in this month alone (July 2015) there have been calls by QM2, Britannia, and Royal Princess. I also wanted to find out what I could about plans for the future. I met with Angie Redhead, Cruise & Operations manager at the terminal, and I must thank her for her time. This first post will deal briefly with the history and with day calls – another post will cover turnarounds and the future. Liverpool is a great cruise destination, of course, and the terminal is excellently located – it is barely a five-minute walk away from the new Museum of Liverpool, Albert Dock is not much further away, and the city centre shops are also close by. However, it presents some challenges in that because it is so centrally located close to all the attractions of the city centre it is necessarily on a small site, and I wanted to learn how these challenges are being tackled. First, the history. Despite Liverpool’s long association with passenger shipping, in recent decades that had shrunk to effectively nothing and the city was getting little benefit from the river. As part of the whole Liverpool regeneration initiative the city council decided to create berthing facilities on the river itself, as close as possible to the city centre, and capable of accommodating the very largest ships, and to this end public money was sought, and obtained, from both the UK government and the EU regional development fund. The project started in 2005, and by 2007 the main pontoon was in place. Although not the very first ship to call, QEII launched the new terminal with a visit in September 2007. I gather this was a memorable event – there were fireworks in the evening and many dignitaries in attendance. Since then terminal has been successful in obtaining commitments from the cruise lines to make day calls at Liverpool, and this year there will be a total of 32. These include not only the very large ships such as QM2, Britannia and Royal Princess mentioned above, but also smaller luxury ships from Regent Seven Seas, Oceania and Crystal, plus more mainstream vessels from Celebrity, Aida and TUI. Adding in the turnarounds there will be over 50 calls this year, and next year’s schedule will see 60+ calls. 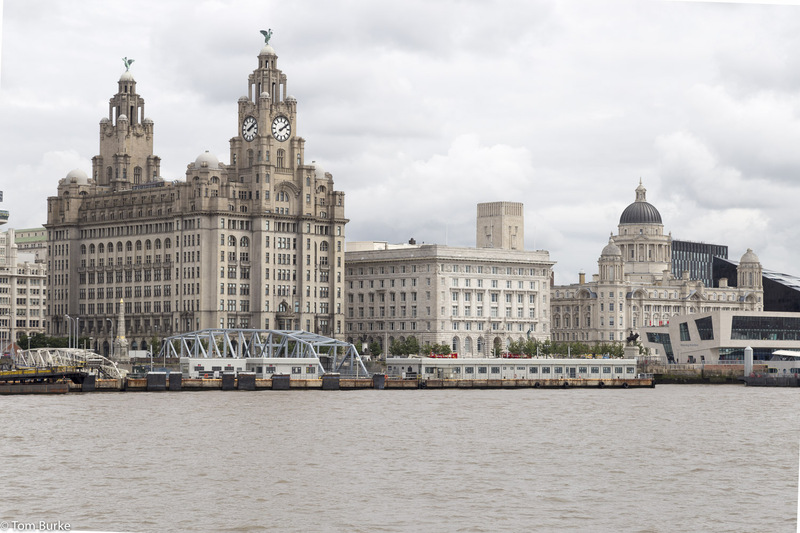 Feedback from the lines indicates that their passengers find the visit to Liverpool as a high-point of their cruises, with the ease of access to the city centre and Liverpool’s heritage as a big part of that. Additionally, of course, Liverpool is well situated for excursions to locations further away such as Chester and Port Sunlight, North Wales, and even the Lake District. The terminal is owned and operated by the City Council, and the development and operation of the terminal and its facilities is closely linked to the city’s overall objectives as regards tourism and marketing the city’s heritage. Angie made the point that this is a strong advantage: they are closely connected to the people who make decisions in the city, and if they need resources for a special day call, then they are made available. For example, the recent ‘Three Queens’ day was very successful but it required huge resources both at the terminal and in the wider city, with 100,000 people lining the river to see the ships, and these were available. The first of the terminal’s facilities is the pontoon. This can take ships up to 350 metres long, and has a depth of 11 metres of water at low tide, so pretty much any cruise ship in the world can berth here. It’s connected to the shore by a set of linkspans, providing both foot and vehicular access between the ships and shore. The terminal building is divided into two parts, quayside and shoreside. The quayside structure is on the pontoon, and is where security is applied – the hand-baggage scanning machines, passport checks, and so on. The shoreside structure is a temporary building (although it’s been up for three years so far…) and is where services such as tourist information, souvenir buying, and refreshments are provided for day call visitors. Basically, whatever services are required for a day call can be delivered in the shoreside location, even if it’s a one-off requirement. The image above shows the terminal from the river. The structure with the roof is the shoreside element; near the left-hand end of that is the covered linkspan down to the quayside element on the pontoon; ships berth just off to the left of this image, so this is actually near one end of the pontoon. The image also shows some of the minibuses available to help passengers if the linkspan gradient is severe, and at the right-hand end the vehicular access linkspan can be seen. The shoreside facility is also where excursions depart from and return to. I asked Angie how they managed this – the coach park outside only has room for about 20 coaches, for example, yet excursions from the biggest ships might require 50 or 60 coaches. This is something that is well-organised, however. In addition to the coach parking at the terminal itself there is a holding area just a few minutes’ drive away that can take a further 30 coaches, and there is yet another location further out again where more coaches can be stacked. So in the morning when excursions are departing the relevant coaches will be called from the holding areas into the terminal coach park when required, and when a coach departs its place will be taken by another coach from the holding area. Of course, this does require that excursion starting times have to be staggered – it wouldn’t be possible for 60 coaches to all start at 9:30, for example – but this staggering of starting times is the norm in all the ports I’ve visited so this is nothing unusual. On return from the excursion it might be that a coach might have to wait for a short while at the holding area before it could come forward to the terminal coach park, but this procedure is closely managed. In fact, the point was made to me strongly that the way Liverpool convinces the cruise lines that the problems caused by the size constraints won’t affect their passengers’ enjoyment of the visit is by ensuring that solutions exist, and that they are actively and effectively managed during a visit. 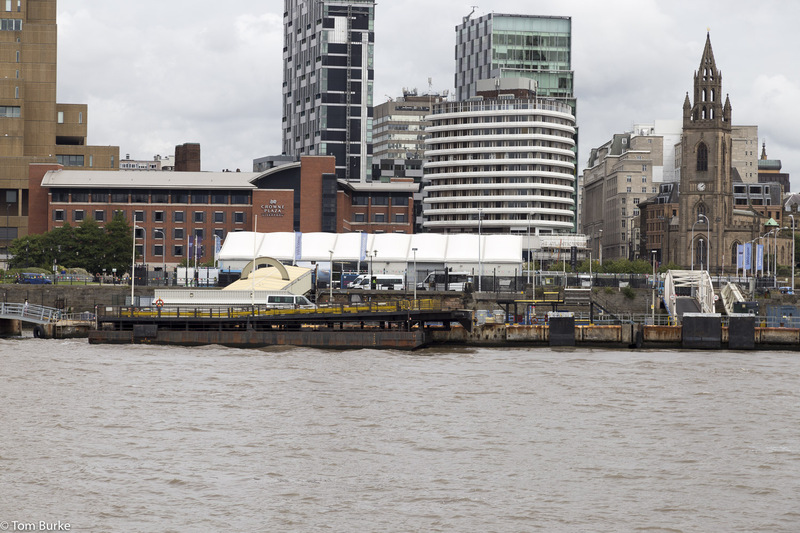 For example, another issue is that the River Mersey has a 10-metre tidal range so it is possible that at times the gradient on the linkspans can be steep, possibly too steep for those with mobility problems. But there is a small fleet of mini-buses on hand which can get up and down a separate vehicular linkspan, and which are used to assist those passengers who need it. I got a strong impression that all these issues have been thought through very carefully, solutions put in place, and then delivered effectively. As Angie said, if problems occur and passengers have a hard time because promised facilities aren’t available, they will complain to the cruise line and as a result Liverpool could be dropped from future schedules. So it seems to me that Liverpool Cruise terminal is on top of the requirements for day calls, and is slowly but surely growing this side of the business. In the last couple of years however, they have added cruise turnarounds from the Cruise terminal, and these present quite different challenges. Tomorrow I will do a further post covering the history and reason for the turnarounds, to outline how these challenges are being met, and what their future plans are.